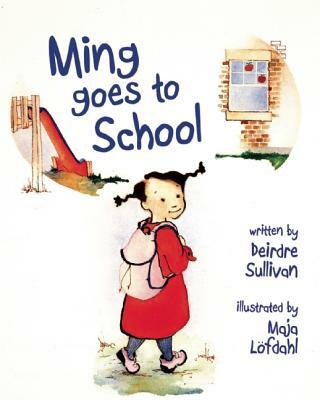 Ming goes to school, where she learns to say hello and good-bye. She meets new friends and introduces them to old friends (including her favorite teddy). She builds sandcastles and makes snow angels; she traces, glitters, and glues. She is so fearless that when held at sword point, she even walks the plank! And when she's playing in the mud, she reaches out and touches the worms with her bare hands. But despite those brave deeds, she isn't quite ready for the big red slide -- not yet. This is a very sweet story with soft, evocative watercolor illustrations that will help kids to grow comfortable with the idea of starting preschool. Ming is curious and playful and ready for adventure, but even she gets scared of new things sometimes. Kids will relate to her desires and fears and will be excited to see Ming at the top of the slide by the story's end. A quiet and reassuring picture book for preschoolers (3-5), this is a wonderful going-to-school story that can be read both at home and in the classroom or childcare center. The illustrations provide a lot of diversity of characters, making this feel like any classroom in any school in the country.